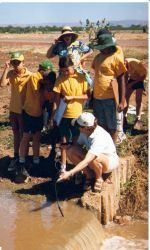 The inaugural Ord Land and Water Management Plan was released in 2000 to guide the local Community in proactive natural resource management of the Ord River Irrigation Area and the Kununurra Township. Recognising the need for a whole of catchment approach to its work, in 2011 Ord Land and Water expanded its role and Board composition to cover the entire Ord Catchment Area. Over the last two years, the Board of Ord Land and Water and Community members have undertaken a comprehensive review of the original Management Plan. This process has been a collaborative effort, lead by the Board and progressed with the commitment and expertise of a wide range of people, the majority of whom are Community members. Each chapter has been reviewed by the Board and then systematically by more than one expert in that particular topic. Given OLW’s expanded catchment role, a new Pastoral chapter has been included in the updated plan. Now sixteen years since OLW was established, in reviewing each chapter, it was heartening to note the goals that had been reached, but also grounding to be reminded that a range of issues require constant and ongoing attention. We live in a beautiful but harsh landscape and it is unique in many ways. Development and progress is inevitable. Our challenge, as a Community, is to balance the advantages and costs of development with care for our land and water resources through evidence based natural resource management. This challenge is both a privilege and responsibility. As a proactive and caring Community, lets continue working together and use this updated Ord Land and Water Management Plan as our guide to take us forward! Since the development of the Ord Land and Water Management Plan (the Plan) in 2000 the wise use of the land and water across the Ord Catchment has become an imperative for the organisation. This was driven at that initial stage by the increasing awareness of the impacts of past uses on surface and ground water quality, the absence of best practices to address those impacts and in particular the scientific knowledge that would underpin those best practices. With the implementation of the plan in the following years, much was achieved. Sections of the plan (Chapter 3 – 3.1, 3.2 and 3.3) became the basis of the Ord Irrigation Cooperative’s “Water Use Improvement Plan” for which Federal Government funding through the “National Action Plan for Salinity and Water Quality” in 2006–2008 provided the resources to carry out the scientific work and assist with implementation. In 2011, Ord Land and Water grew from being a local group with its focus on the Ord River Irrigation Area, the Kununurra townsite, the Lower Ord and Dunham rivers, Lake Kununurra and Lake Argyle to covering the whole of the Ord Catchment including sections inside the Northern Territory. Along with that organisational growth and the work undertaken in the decade since the development of the Plan, the focus within the catchment changed from dealing with the unknowns to maintaining the gains that had been made to date. This included ensuring that management practises were reviewed and where relevant, updated to suit the future needs of both Industry and the Community. The Community is fortunate that many Ord Catchment resources remain in good order and also that effort was made in the past to address the resource management challenges associated with our use of them. Today there are whole of landscape based feral animal control programs and collaborative weed control programs all successfully operating. The Ord Stage 2 concept has been realised as the Goomig Farm Area with state of the art irrigation delivery systems in place and in line with community expectations and the Knox Creek plains area is on the cusp of being developed as additional irrigated agricultural land. However, there remains a wide range of land and water management issues to be addressed with some considered to be serious, that will continue to require commitment, knowledge and resources to address them. Ord Land and Water’s approach in the initial stage of developing the Management Plan, prior to its release in 2000, was to empower the Community to identify the issues it saw as important to the long-term, wise use of the land and water that make up the natural resources of the Ord River Irrigation Area and surrounding riverine systems. Phase 1 – Information transfer and awareness building: using a number of media forms including newsletters and media releases. Phase 2 – Identification of the management issues: through consultation with industry, community and other stakeholders culminating in the formation of four Local Action Groups made up of community members. Phase 3 – Setting of goals and development of strategies: to address the issues identified during phase 2. The publication of the inaugural Ord Land and Water Management Plan in 2000 marked the end of this phase. Phase 4 – Implementation of the Plan: through the development of partnerships between Government Agencies, industry and the community. The Community, through its local action group members, decided the best option was for a Board of local people to oversee the implementation of the Plan and that this Board be provided with resources to enable it to function effectively. This Board would consist of six elected Community Board members. They would have the power to co-opt two additional full time members to form the full time membership of the board. Relevant experts would be brought in to assist make decisions on particular aspects of implementing the Plan. The experts would function as full members of the Board during the deliberations within their field of expertise. Only residents of the Shire of Wyndham East Kimberley would be eligible to serve as Community Board members and upon leaving the Shire the member’s position would be deemed to become vacant. The Board would be responsible for deciding their operating rules, succession plan, values, vision and goals. 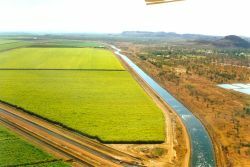 The Board would be charged with implementing the recommendations contained within the Ord Land and Water Management Plan and for ensuring an ongoing commitment to improving management of land and water in the Ord River Irrigation Area. In 2011, Ord Land and Water extended its interests to include the entire Ord Catchment. 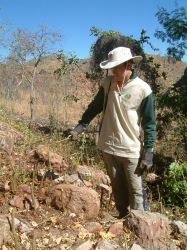 This was done after considerable consultation with a wide range of stakeholders including the Halls Creek East Kimberley Land Conservation District Committee and the Victoria River District Conservation Association located in the Northern Territory. With the latter organisation it was agreed that there would be some shared responsibility for the section of the Ord Catchment that extended into the Northern Territory. Membership criteria was changed to ensure the wider catchment was represented at a Board level with constitutional changes also made to ensure there was a split in membership to cover both the town and pastoral areas of the catchment. With the expansion of the organisation came the need to review and update the Plan to include where necessary, sections and/or issues either not catered for initially or that had changed in the years since the inaugural Plan’s development. In 2015, to minimise costs, this work was progressed “in house” through a rigorous process of the Board reviewing section by section of the inaugural Plan and updating or developing new goals and the OLW Coordinator drafting background information and strategies to match the goals. Stakeholders with relevant expertise generously reviewed each updated or new section. A wide range of issues at the catchment level associated with the use of the land and water are now identified in the Plan with the existing knowledge and knowledge gaps associated with those issues. This updated plan builds on the inaugural Ord Land and Water Management Plan released in 2000 and is based on extensive community consultation and involvement over a period of eighteen months. The original plan focussed on the Ord River Irrigation Area Stage 1. Recognising the impact of upstream influences on the downstream land and water, in 2011 the Ord Land and Water Board expanded its area of interest to include the entire Catchment and accordingly changed its Constitution to provide for its Board Membership being derived from two Wards. Ward A from the Irrigation Area and Ward B from the pastoral area of the catchment. This updated plan focuses on land and water management in the entire Ord Catchment, which includes the expanded Irrigation Area Stages 1 and 2, the three towns and the relevant Pastoral lands. To maintain continuous improvement in the management of the land and water in the Ord Catchment and build on the achievements of the inaugural plan, it is critical that we as a Community work collaboratively and consciously to implement evidence based land and water management practices. Equally it is important that we engage in research to further enhance our practices. This updated plan is the instrument that will guide the Community going forward in the care of its land and water resources, without which we would not have the culturally rich, attractive and productive Catchment that we share with each other and our visitors. Continued implementation of the updated plan requires the same high level of commitment that individuals, groups, organisations and agencies have shown over the past fifteen years. All those involved will, as previously, incur some costs to facilitate the continuous flow of benefits from improved land and water management. As described in the inaugural plan, some of the benefits will result in improved returns or reduced costs directly to users, while other benefits will be more of a community nature for which values are harder to establish. As knowledge and technology improves, new techniques will become available for pasture management, pest and weed management, laser levelling and irrigation. The inclusion of wildlife corridors and buffer zones in the development of Ord Stage 2 and the joint management of the new Mirriuwung Gajerrong Conservation areas are examples of an enhanced understanding of how to care for our catchment. As Ord Stage 2 and potentially Ord Stage 3 are developed, water efficiency will become increasingly important. Diversification in the Pastoral industry and shared use of the water resources of the Ord River for irrigation, hydro electricity production and tourism will require ever vigilant thinking and evidence based decision making. Pressures on biosecurity as the population of the townships increase and the irrigated agricultural area expands from weeds and pests will require research and committed collaboration to limit their impact. 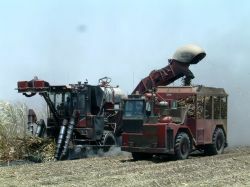 “Some management changes will be necessary to avoid major land and water management problems in the future for which there are no clearly obvious financial returns, at least in the short to medium term. The extent, and even the nature, of some of these problems can not yet be clearly defined, but the trends are convincing that without action land and/or water quality will be reduced in future. The challenge is to continue to measure the impacts of our use of land and water in ways that enable new and improved management strategies to be developed into the future. In 2000, the local action groups that developed the original Ord Land and Water Management Plan agreed that there needed to be a responsible local body to deliver the outcomes from this plan. To achieve real improvement in land and water management throughout the Ord Catchment there would be an ongoing need for supervision, support and encouragement for those making the changes. The Board of Ord Land and Water was established as a “Board of Local People to oversee the implementation of the Plan”, with six elected Community Members and the option to co-opt two more. With the expanded area of responsibility from the Ord River Irrigation Area to the entire Catchment, the size of the Board was expanded from six to eight and its representation changed to cover both the wider Catchment (Ward B) and the Irrigation Area (Ward A). The Board continues to have the power to co-opt two additional full time members if it considered particular groups within the community were under represented. These eight to ten members form the full time membership of the board. Relevant experts will continue to be brought in to help make decisions on particular aspects of the plan implementation. These experts will continue to function as full members of the Board during the deliberations within their field of expertise. Only residents of the Shire of Wyndham East Kimberley and the Shire of Halls Creek will be eligible to serve as community Board members. Upon leaving the Shire the member’s position on the Board will be deemed to become vacant. The continuing Board will be responsible for deciding on its operating rules, succession plan, values, vision and goals while overseeing the appointment and management of a project coordinator, where funding permits. The Board will continue to be charged with implementing the recommendations contained within the Land and Water Management Plan and for ensuring an ongoing commitment to improving management of land and water in the Ord Catchment.